Clockwise from top: corn reaching to the sky; our intensively planted beds, with room still left over for more seeds; using string to divide a large bed; forsythia blossoms – a good indicator that it’s time to plant peas. Over the past two weeks, we explored how to do a site assessment and how to choose what to plant & where to place it within your garden. Now that we’ve figured out our gardens in terms of space, it’s time to plan them in terms of time. Garden planning is a dance between what you want to do with your space and what you *can* do. With this final part of garden planning, we fit the pieces of the puzzle together. As urban vegetable gardeners, we need to plant seeds many times throughout the year in order to achieve a consistent harvest. Different crops require different soil temperatures to germinate. Spinach, for instance, prefers cool weather and can be planted in late winter when night-time temperatures still dip below freezing. Squash, on the other hand, needs warm soil. Google the “average first and last frost frost date” (date on which night-time temperatures fall below 0 celsius) for your city. These dates will be your guideposts. Here in Vancouver B.C., our average last frost date is March 28, and our average first frost date is November 5. Next, get ahold of a planting chart — a table that lists the best planting times for different crops. There are lots of them out there online and in books. Here’s a simple one that works for any climate. Here in Vancouver, I love West Coast Seeds’ famous planting chart. Once you know your first and last frost dates and have a good planting chart in hand, you’re halfway there towards having a good planting plan. You’ve probably heard it before, but it bears repeating: don’t plant all of your seeds at once! If you plant your entire garden up in early May, you’ll end up with so many crops in June that you can’t possibly eat them all, and nothing for July. You need to plant small amounts of seed regularly throughout the year. If you’re a new gardener, keep things simple. Divide your garden into a few sections (use strings to divide large beds, like this), and commit to planting just one or two sections, every week or two. Cover any unplanted spaces in your beds with leaves or grass clippings to keep the soil protected. Then, harvest the crops that are ready, add a bit of finished compost or organic fertilizer to the newly blank section, and plant more seeds in the newly blank spot. 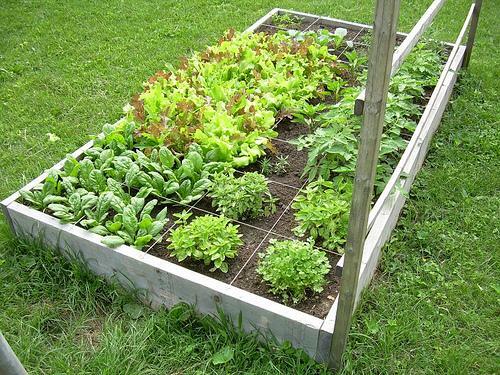 Let’s imagine that you live in the Pacific Northwest and have three 4’ x 8’ raised beds in your garden. Using the principles we discussed last week, you decided to plant one bed with an early crop of lettuce followed by corn, beans and zucchini; another bed with spinach followed by tomatoes, green onions and carrots; and a final bed with peas followed by a fall crop of kale. Let’s use strings and nails to divide your beds into sixteen 1’ x 2’ sections. In bed #1, you’ll start off planting one square of lettuce seeds per week from early April to mid-May — six squares in all. You’ll leave much of the bed empty, because in mid-May, you’ll be planting your corn and bean seeds in the same place, as well as a couple of zucchini seedlings. The lettuce can coexist around the zucchini plants while they’re still small, and you’ll pull them out once the zukes take over. In bed #2, you’ll plant the spinach much the same as you’ll plant the lettuce, one square per week, starting in early March. Actually… on second thought, you decide that your priority is being able to eat home-grown spanakopita in the middle of January, so you decide to plant the entire bed up with spinach in March, harvest it all in mid-May with a big pair of scissors, and freeze it up to eat in the winter. Now, your bed is ready for a new crop, so in go eight tomato seedlings, along with some finished compost from your worm bin. Around them, you’ll plant some carrot seeds, making sure that your soil is fine-textured enough to accommodate the delicate sprouts. And you’ll add some green onion and maybe basil or parsley seeds too — all of those crops are very happy growing underneath the tomatoes. Or, maybe you’ll hold off on adding compost and see if your spinach plants grow back for a second harvest. Bed #3 is in a cooler part of your garden. You’ll start off with a row of peas, planted in mid-March, as soon as your neighbour’s forsythia blooms (don’t confuse it with the similar looking but earlier blooming witch hazel). The peas only take up half of your bed, so you’ll also plant one square per week of small brassica greens such as arugula, radishes, or mustards. Those crops don’t like too much heat and will appreciate being shaded by the tall pea plants, while soaking up the extra nitrogen that the peas add to the soil. Then, in July, when the pea plants stop producing, you’ll pull them out along with any remaining greens, and plant eight vigorous kale seedlings that you started a few weeks earlier in little pots. You’ll put some mulch (straw, leaves, a cover crop or whatever else you can get) down to protect the bare parts of your soil. Those kale plants are small now, but they’ll grow quickly for harvests until mid-December. Your squash, beans, corn and tomatoes will hopefully keep going until the early fall, especially if the tomatoes are protected by the tallest row-cover you can build. When they finally give out, clean up your beds and cover them with mulch or a cover crop. There you have it! A simple plan to get a consistent harvest all season long. Isn’t it amazing how much you can grow in a small space? With good soil and a consistent approach to planting, it’s possible. Planting charts are great, but the truth is that our gardens are subject to the vagaries of climate change and year-to-year weather fluctuations. March 28 is the average last frost date in Vancouver, but the actual last frost date might be quite a bit earlier, or later. As Pam Dawling says in one of my favourite gardening books, Sustainable Market Farming, “In agriculture we have to be ready to adapt, as many things are outside of our control. Having a good set of plans actually makes it easier to make changes and see how this will affect other parts of the farming year.” Check the weather report, use a soil thermometer, and for the most accuracy of all, use cues from nature — plant peas when the forsythia blooms, and set your tomatoes out when the flowers on your neighbour’s dogwood trees open. Many serious vegetable gardeners, and pretty much all sustainable farmers, create detailed charts and calendars to map out their harvests. Next week, we’ll explore a simple method for scheduling your harvests and for keeping consistent records. Want to work together to create a custom plan for your garden? Join me in Vancouver this Spring for Urban Garden Abundance.